Just a small note to say this is silly. Nadia Eweida has my full moral support. "The letter, which is the outcome of a joint effort, was signed by top religious authorities such as Shaykh Ali Jumu‘ah (the Grand Mufti of Egypt), Shakyh Abdullah bin Bayyah (former Vice President of Mauritania, and leading religious scholar), and Shaykh Sa‘id Ramadan Al-Buti (from Syria), in addition to the Grand Muftis of Russia, Bosnia, Croatia, Kosovo, Slovenia, Istanbul, Uzbekistan, and Oman, as well as leading figures from the Shi‘a community such as Ayatollah Muhammad Ali Taskhiri of Iran. The letter was also signed by HRH Prince Ghazi bin Muhammad bin Talal of Jordan and by Muslim scholars in the West such as Shaykh Hamza Yusuf from California, Professor Seyyed Hossein Nasr of George Washington University in Washington, D.C., and Professor Tim Winter of the University of Cambridge. All the eight schools of thought and jurisprudence in Islam are represented by the signatories, including a woman scholar. In this respect the letter is unique in the history of interfaith relations." The Benedict Blog: "Benodette, from the RatzingerForum, reminded all of us today of a much-overlooked address by Benedict to representatives of some Muslim communities, whom he met while visiting Cologne for World Youth Day on Saturday, August 20, 2005 [...] You can find the full text on the Vatican website." Jim Tucker: "The lecture was about Logos -- reason, reasonableness, rationality -- as the necessary underpinning both of faith and secular society, that without a common ground of reason, then conversation becomes impossible, violence drives out discourse, and we become fragmented, individualistic, miserable human beings, each man trapped within a self that can never be understood by anyone else, and God Himself becomes unknowable and beyond any hope of man's apprehension." And by way of Tariq Nelson, I came across this blog by a Catholic from London (where the comments, sadly, reminded me of The Great Jafi), who photographed the usual collection of "professional Muslim extremists" (as my brother calls them) shouting and jeering outside Westminster Cathedral. These people, as one can see from the photos, are the usual suspects that turn up for a photo opportunity whenever they can sniff any kind of publicity (who said they were anti-modern?). They have, at one time of another, been part of the now disbanded al-Muhajiroun, al-Ghuraaba or the-group-that-wasn't-a-group-but-a-collection-of-individuals known as The Saved Sect. I wonder what pseudo-Islamic, egotistical freakshow they belong to now; Brothers Against Car Insurance? Indolent Strangers for the Welfare State? I'm disappointed that the police actually let this collection of idiots, halfwits, morons and fools harass people leaving a church. The Pope has offered an apology for his original comments. The MCB did demand a further retraction by Ratzinger in person, although the Islamic Society of Britain (ISB) had said Muslims should gracefully accept the earlier explanation. Muslim organisations, politicians and parliaments around the world also asked for an apology (the Ikhwan in Egypt have accepted his apology as "sufficient"). Various Arab, Turkish, Iranian and Pakistani newspapers have also responded. What is plainly obvious is this. Benedict XVI has made some factual mistakes in quite a dry speech (pdf) aimed at academics. Somewhat ironically the speech contains much else that many Muslims would probably agree with (for example, his views on religion, faith and secularism). But whilst talking about religion and violence, he has ignored the violence his own organisation has been involved or given its blessings to. What's more the quote about 'evil and inhuman things', taken from the Byzantine emperor Manuell II, dates back to 1391; the very year massacres of Jews took place across Catholic Spain. Something about casting stones comes to mind. 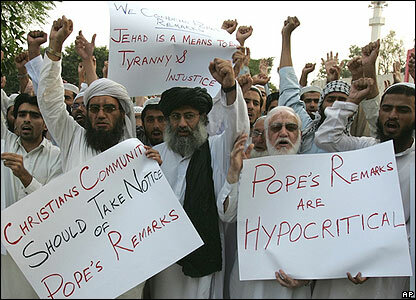 "Many Muslims have been uncomfortable with Ratzinger because of his public statements about Islam. Yet we should be wary of emotional responses; and act in our interests, which are also those of a well-integrated, tolerant and successful Europe." I'm with the ISB, and Aisha E, on this one. We can and should rise above this. Use this an opportunity for something good. The Pope was talking about religion, reason and violence and made some comments on Islamic theology, Surat al-Baqarah and jihad, in amongst some points that Muslims would probably agree with. Where then was the response from leading Muslim intellectuals and religious authorities clarifying the ethic of jihad (and so rescuing it from the slur that some Muslim extremists and anti-Muslim bigots place on it), the place of reason in Islamic theology (whether we take a Ghazalian, Maturidian or Taymiyyan approach, or look to Ibn Rushd), and the verse mentioned by the Pope? He wants to talk reason within faith, why not give him such a discussion and take up his challenge? But no; that would be too easy and we'd rather be quick to take offence and wallow in our emotions. Secondly, even if the Pope had no intention of slurring the Prophet (upon whom be peace), and was making only a philosophical point, as a Catholic he will never share the same sensitivities towards the Prophet (upon whom be peace) that we do. Unless the Pope had called for a wholesale extermination of Muslims (which he was far from doing), then Muslims should grow thicker skins. Some of us don't hold back on our views on Christianity, Judaism, Hinduism and secular belief structures, so why then must we expect someone else to tip-toe around our beliefs? By trying to muzzle others we merely end up muzzling ourselves and make any criticism by Muslims look empty and downright hypocritical. And if Ratzinger's point was to say there is something inherently violent about Islam, then the response by some must surely confirm his own beliefs. How does attacking churches prove that Muslims are not violent? Even worse, an Italian nun has been murdered in Somalia (it isn't clear that this murder is linked to the recent furore, but I wouldn't be surprised). I'd agree that the political climate (and a general lack of law and order) helps foster anger towards something alien and foreign, away from the tyrants who rule in some Muslim countries (since not all Muslim countries are autocracies; this is something the Middle East suffers from). Others add that these events must be seen within the context of wider political situation (e.g. the Iraq War). But Pakistan has the freest press in the Muslim world, and, in some cases, Pakistan's press is even free of the political servitude that we see in some liberal democracies (it would be hard to find outright fawning of any Pakistani leader that you see in the US, for example). In Palestine, where churches came under attack, both Christians and Muslims suffer from Israel's aggression. And the fact is some of the major churches were the loudest opponents to the invasion of Iraq. So I am not prepared to reduce other Muslims to robots who simply react without a will or desire of their own (for even a slave has a choice: to live the life of a slave or to choose death). Thirdly, we see a skewed principle of priorities. As Aisha says where are the demands and protests that people who kill Muslim children and impoverish Muslim nations be punished? In a week when Darfur comes under the media glare again, we have some Muslims vexing themselves over something they have not read, nor will ever read (Rushdie taught us that). And what can be a bigger slur on Islam than the Kafkaesque Hudood Ordinance of Pakistan? Yet, I don't see too many of these chaps protesting against that (quite the opposite in some cases). Austrolabe: "[W]e must make genuine connections with religious Jews, away from the spotlight, and work together on the many issues of common concern in a world that is increasingly hostile to both Semitic traditions. Vitriolic anti-Jewish rhetoric is not a triumph of our interests but rather marks a defeat of them. Our fates in the modern world are inextricably linked to the Jews and we must work sincerely with those who have similar qualities within their community [...] Muslims do not realise what battles Jews fought for pluralism in the Western democracies that were previously very hostile to them. Without Jewish activism there would be no Islamic schools, no Halal meat and no male circumcision and perhaps not even any mosques (remember that the first Ottoman diplomats had to be baptised before they were allowed on British soil at Portsmouth during the reign of Victoria)." "Which roots would these be? [...] Most Christains that I have spoken to are ashamed by the "roots" of the Christian Church in Europe. Whether it be burning witches at the stake or killing Jews or heretics the roots of the Christian Church in Europe are mired in the blood of its opponents. Therefore I find it surprising that the Bishop would want a return to that type of situation." Is this really fair? Why must these practices form part of the "roots" of Christian Europe? Why essentialise Christianity to include these cultural practices which once occured in Europe? Afterall, don't Muslims say that cultural practices such as honour killings and female genital mutilation should be divorced from some essential aspects (the "roots") of Islam? Secondly, why not look at the better aspects of Christianity's "roots", and assume this is what is the bishop was referring to? Why would he want to burn witches and restart progroms against Jews? Why not, instead, look at the high culture of Europe's Christian past? Its architecture, its spiritual and artistic works? Why not look at Aquinas, Ockham, Bacon or Erasmus? I find that sometimes Muslims are very quick to accept secular critiques and histories of Christianity in Europe and to look only at its ills. This is especially true with respect to the historical relationship between science and religion in Europe, where Muslims seem to adopt Victorian atheists' views of science and Christianity with alarming ease. This is unfair, given the number of people who we would recognise as scientists who were (and are) also Christian. We ask others that they read our histories, sources and texts with sagacity and respect, to not do violence to them, and to criticise with fairness. We should then try and be the best exemplars of said methods, by extending the courtesy to others in doing the same to their histories and sources. Svend has a detailed look at Islam, Christianity and Judaism. There is also an interesting article by Moiz Amjad on the similarities between Islamic and Mosaic practices. I linked to some sources on the idea of a Judeo-Christian tradition a week or so ago. Since then Eteraz and Haroon have both discussed how far this term can withstand scrutiny. "In The Myth of the Judeo-Christian Tradition (Harper & Row, 1970), Jewish theologian-novelist Arthur A. Cohen questions the theological appropriateness of the term and suggests that it was essentially an invention of American politics. Three cheers for that earlier political use, for it grew out of an effort to promote interfaith concord and to put an end to ageless prejudices. Now that the "Judeo-Christian tradition" is back for a second round in American politics, give it at best one and a half cheers, for its use can also license or disguise mischief. Criticism of the term will not and probably should not abolish its use (though I, for one, believe a better historical case can be made for referring to "the biblical tradition"), but it may encourage citizens to regard it with suspicion. The most controversial use of the term is in judicial and legislative debates. It comes up in controversy over school prayer amendments or in education bills. In one recent bill, undefined and indefinable "secular humanism" was legally ruled out of the schools in the interest of Judeo-Christianism, the faith of the majority. What it comes down to is the notion that this majority faith should somehow be legally privileged if not formally established as America’s faith. The campaign succeeds old and failed ones that would have passed a Christian amendment to the Constitution officially designating America a Christian nation. This new campaign stands a better chance of success than did the older, more restrictive-sounding ones, though not a few Jews and other Americans think that "Judeo-Christian" is often a code word for those promoting a Christian America."